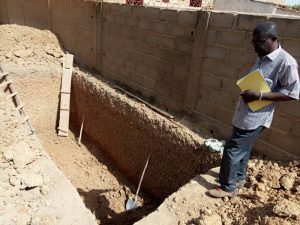 It may not look like much at the moment, but this ‘hole in the ground’ has the capacity to improve health outcomes for thousands of people in Burkina Faso. One of the areas where our health clinic has sought support is in the construction of latrine facilities on site. Lack of toilets and washing facilities, particularly for expectant and new mothers, together with those with other health conditions, has created a significant problem and we are delighted to see the construction of these facilities get under way. Thank you to the donors who have made this work possible. Support for Bethanie health clinic continues and please contact us if you would like to learn more about our current priorities there..